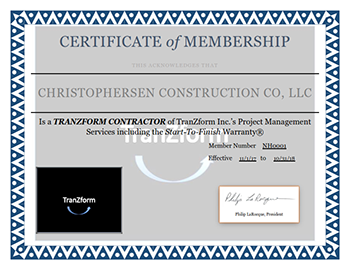 Tranzform Certificate - Christophersen Construction Company L.L.C. The Warranty is provided as an added value of working with a TranZform Contractor at no additional charge to the Customer. a. You would include the cost in your administrative costs just like your liability insurance and then mark up your price accordingly. It is totally your choice to keep your pricing the same, lower it or raise it. This is a service backed by TranZform Inc.
a. Send customers to our website: www.tranzform.biz/ for additional information. You are able to provide the Warranty to your customer by having undergone and passed rigorous Character, Capacity, and Capital scrutiny by TranZform Inc. and are therefore approved as a TranZform Contractor. TranZform Inc. now assures your customer that their project will be completed and their investment protected.